Jay gave Madeline her first scooter for Christmas. It's the old fashioned Radio Flyer with 3 wheels. 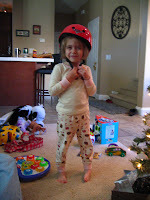 He also included in her gift a helmet, knee, and elbow pads, for those inevitable spills. She likes riding it, although she has to build up her leg muscles and coordination a bit more. 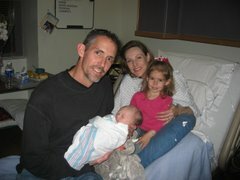 If you click on the above picture, you'll see Mason's first knife. Jay thought it wouldn't be too early to get his son started on a knife collection. 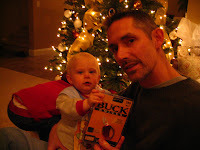 And his first one should be a Buck. Mason's been having fun cutting up the carpet, some of his stuffed animals, and his sister's hair! Mason is a very curious little guy. 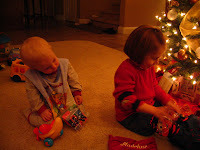 He loved watching Madeline open her gifts and play with them as opposed to playing with his own gifts. But Mason does love to play with balls of all shapes and sizes...and textures. 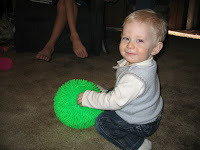 This "hairy" ball is one of his favorites, sent to Madeline and him by their cousins in Alaska, Luke and Niccole. These are certainly not all of our Christmas pictures. I have yet to filter through them all and I will eventually add the best ones of our time in El Centro with our sister-in-law, Vicki, and her boys, Caleb and Asa. We all spent the holiday with Gramma and Grandpa. If you visit Jay's blog (see the link in the margin), you can watch a video he made with the boys. We had such a great time! Thanks, family, for giving us such wonderful memories. 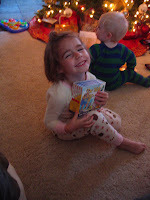 Loved these photos of your Christmas. We love you all so dearly!